Situated on Albyn Place in the west end of Aberdeen, St. Margarets School for Girls was founded in 1846 and has been open for over 150 years. Originally it offered boarding and day schooling, however for many years now it has only offered day school teaching. In 1939, boarders at the the Aberdeen Girls Schools of St Margarets and Albyn were moved to the country. Albyn to Blellack House in Logie Coldstone and St. Margarets initially to Glenbuchat. 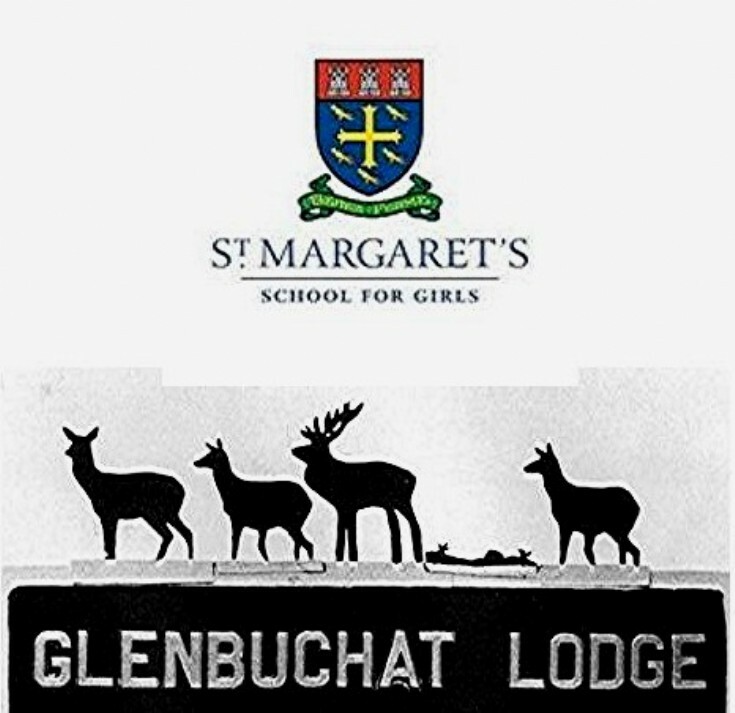 In 1940, as Aberdeen became a bombing target for German aircraft, the pupils of St Margaret’s school for girls in Aberdeen, including two of Colonel Milne’s daughters, were evacuated to Glenbuchat and they took up residence in the two shooting lodges in the Glen – the junior girls being accommodated in Castle Lodge while the senior girls spent their time in the Top Lodge, located a few miles up the Glen. “With the coming of war in 1939 the boarding houses were evacuated to the country, both because the school's buildings were requisitioned and for the greater safety of the children. Glenbuchat, 40 miles from Aberdeen on Upper Donside, was the first place of refuge. Colonel Barclay Milne allowed the school to use his shooting lodge, a substantial building at the head of Glenbuchat, for the Seniors, while Junior boarders were accommodated in part of his own home, Castle Lodge, at the foot of the glen. Here was remoteness indeed, especially for those in Glenbuchat Lodge, where the main road was seven miles away and the nearest small shop five miles down the glen - a horse-drawn sledge was needed to deliver the groceries in the snowy winter of 1939. The boarding girls and staff had to be quite independent, with no domestic or other help near at hand. Some boarders learned to catch fish, and everyone profited from endless opportunities for nature study. Perhaps there are still some of these girls, or their relatives, about and you may wish to give us some more details of the short period they were at Glenbuchat. Please get in touch using the section below. Researching Blackhall castle, 3 Benton brothers 9aged 8,7and 6), fresh from Malaya, plus other families (eg Dr McPherson's two children) were evacuated from Stonehaven Mackie Academy to stay at the Castle with all those St Margaret's girls. No one believes us! Collected spaghnum moss for bandages, i recall only. 1940? I was at Blackhall Castle from 1940-42. My mother and I living with major James Keith and his wife Auntie Mary in Pitmedden House. He and my father served in the Royal Field Artillery in the First World War and remained good friends. My father Brian was back in the R.A. and my brother David in the Royal Marines and the Keith's offered us a home to save having to cross the Irish Sea because our home was in N.Ireland. The only other pupil I remember was Catherine Stevens, she was a refugee from England and became and married a doctor and lived in Devonshire.